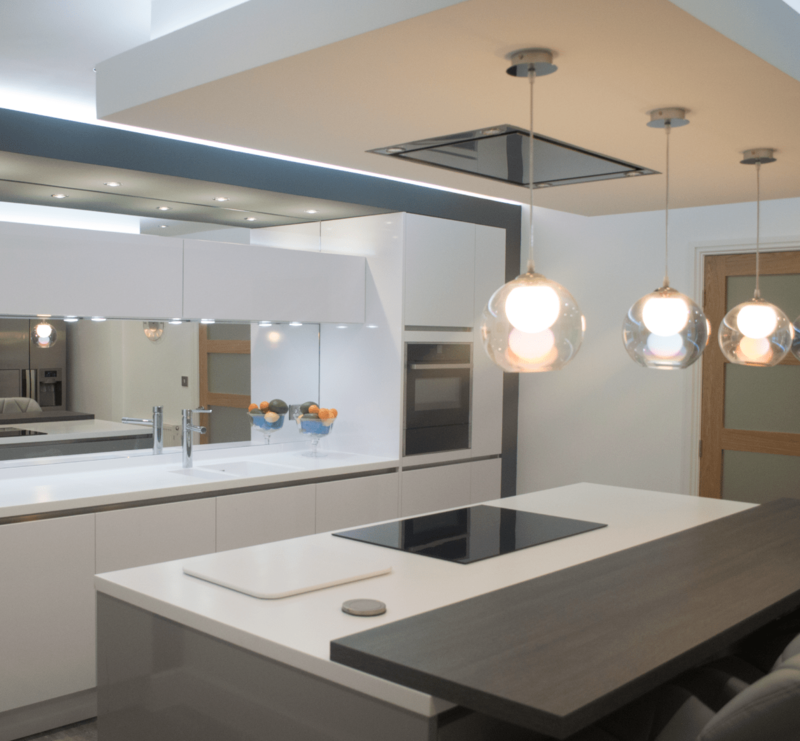 Having modernised and updated the rest of their home over recent years, Mr and Mrs Killeen from Oldham decided it was about time to tackle their kitchen. While it was already functional, the design just wasn’t to the couples’ taste. Instead, they wanted a kitchen that was modern, contemporary, and made the most of the space available. Finding the right designers for the job was easy. Being local to the Manchester Kitchen Design Centre showroom, the couple decided to pop in. “On our first visit we met Emma Holmes, one of the designers, and didn’t look back,” says Mrs Killeen. “We clicked with her right away and loved all of her ideas,” she adds. 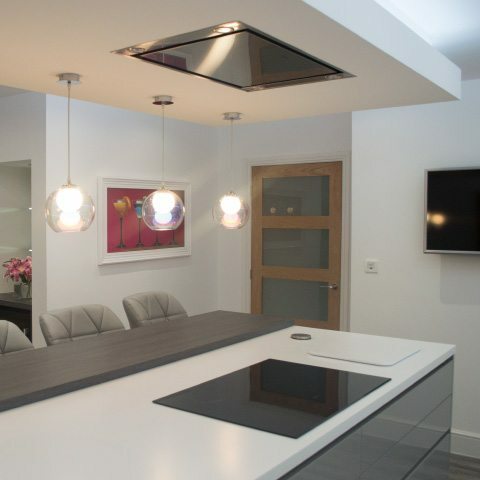 After diagnosing and discussing the problem areas of the Killeen’s kitchen, which included poor lighting and dated design, Emma came up with a whole host of ideas to transform the couple’s kitchen. “We had a few requirements but we were mainly guided along the way by Emma,” explains Mrs Killeen. To address the issue of poor lighting, Emma added plenty of mood lighting across the kitchen. 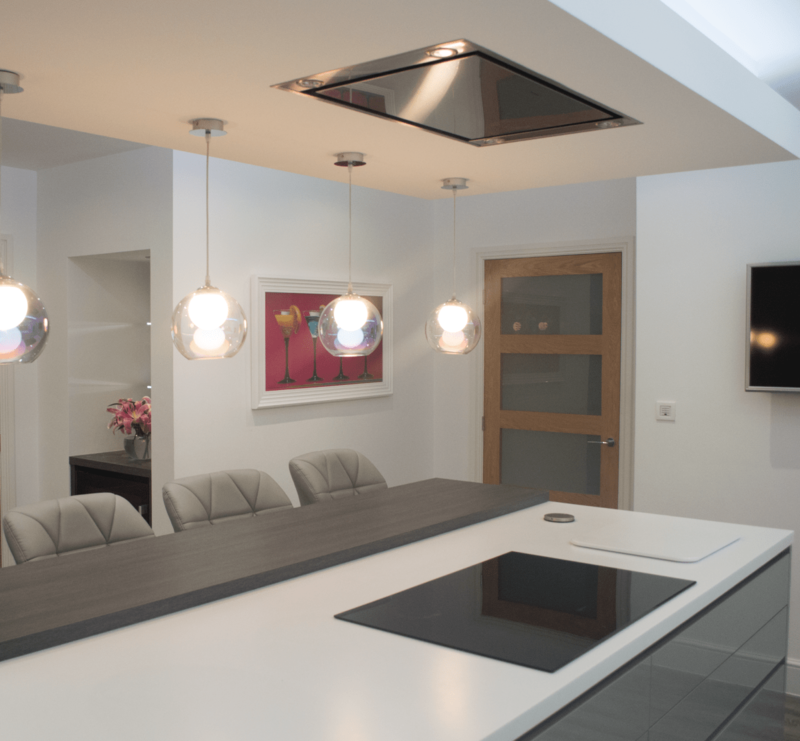 This atmospheric lighting was perfect for parties and social soirees – ideal for the sociable Killeen family. 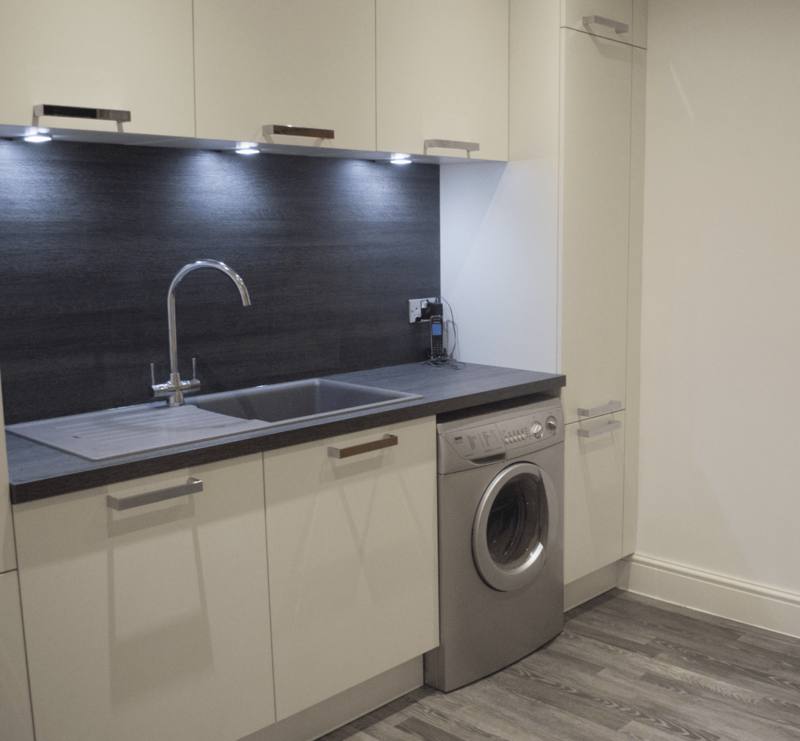 Mirror splash backs were also added to reflect the light – helping the kitchen space appear brighter and larger. 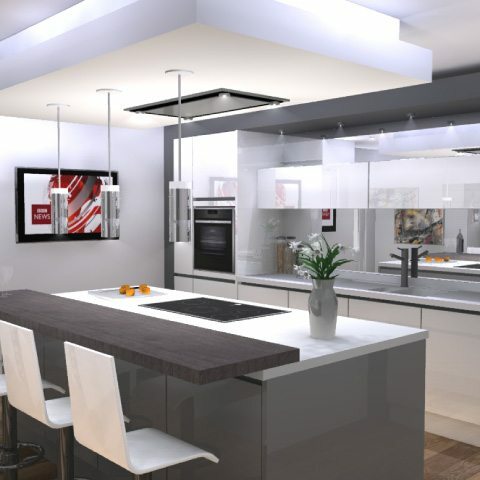 Timeless design was achieved with a chic grey and white colour palette, which included cabinets in Laser Brilliant Polar White Gloss and Laser Brilliant Pearl Grey. 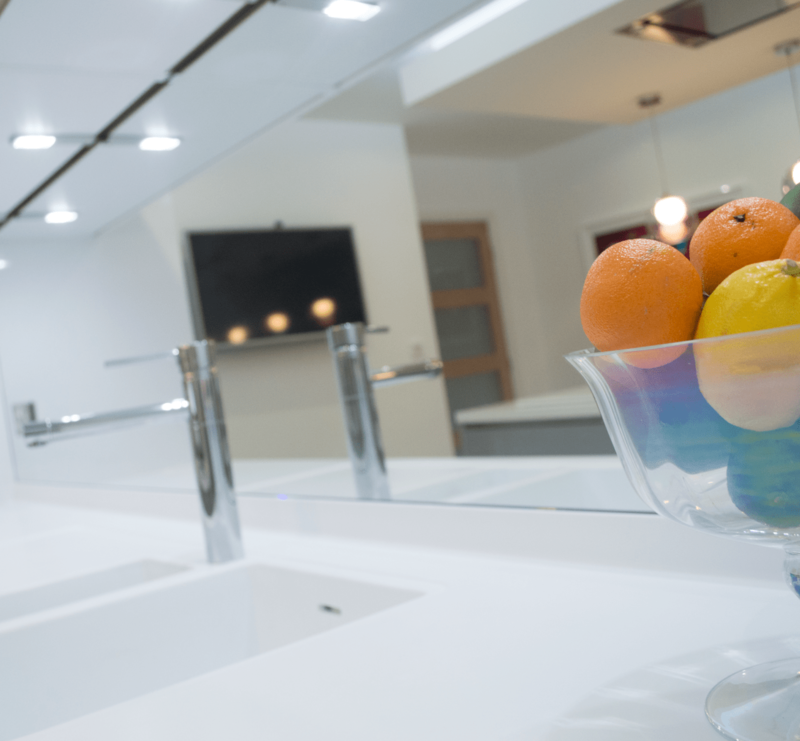 Stylish worktops accompanied this look in 40mm Corian in a Designer White shade. To add a touch of wow-factor, Emma was keen to integrate some innovative design features too. These included a floating breakfast bar in 40mm Silver Oak, funky studwork detail, which featured on the ceiling, and a built-in wine cabinet drinks area. Of course, the Killeen’s new kitchen wouldn’t have been complete without the best in appliances too. The majority of appliances were Neff-designed, and included their combination microwave, warming drawer, single oven, induction hob and dishwasher. 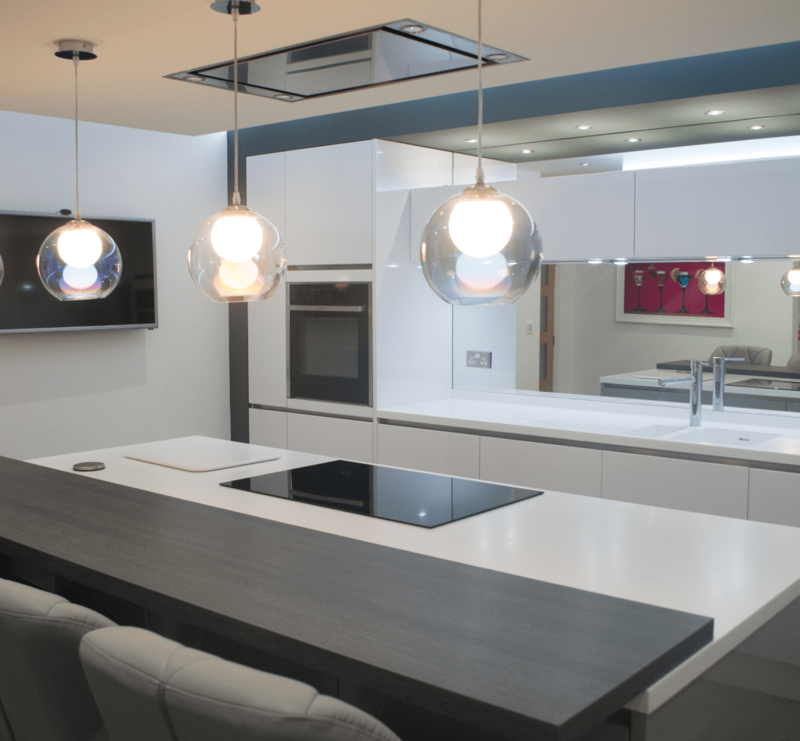 The team also installed a Faber Heaven ceiling extractor and a Blanco City Tap. 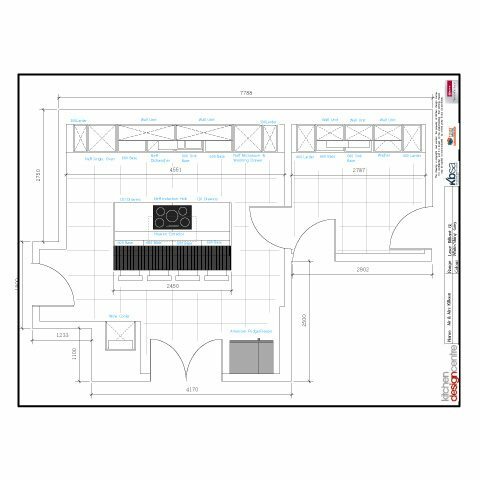 "The Kitchen Design Centre team couldn’t have been more helpful. They made what would usually have been a stressful process as easy and problem-free as possible"
"It was really important to design a space fit for all the Killeen’s needs. 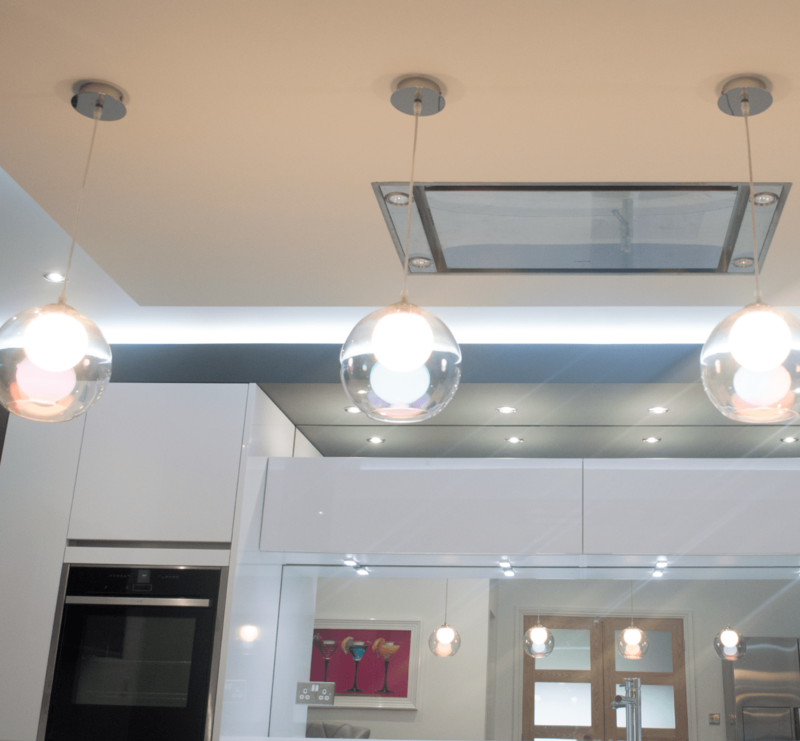 The client’s original kitchen in their Oldham property lacked proper lighting, so incorporating lots of good lighting was key. The Killeens entertain lots of family and friends too, so the design needed to be really fabulous! To top it all off, we added fantastic Neff appliances and a chic colour scheme for a space that looked great and functioned perfectly."